﻿﻿As much as I learned from the workshops that formed the meat of the symposium, I think what was most important was being part of an amazing collective energy. 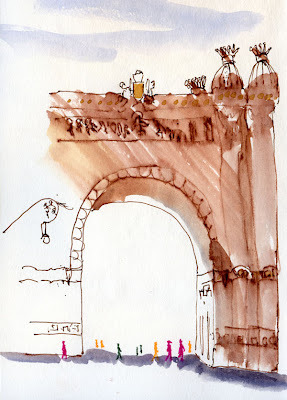 My most memorable moments in Barcelona are about meeting sketchers I’ve long admired online; chatting with fellow participants about our local sketching communities; and sharing a common passion even when we barely shared a common spoken language. After the paint has dried and the last sketchbook page has been scanned, ultimately the Urban Sketching Symposium is about people. 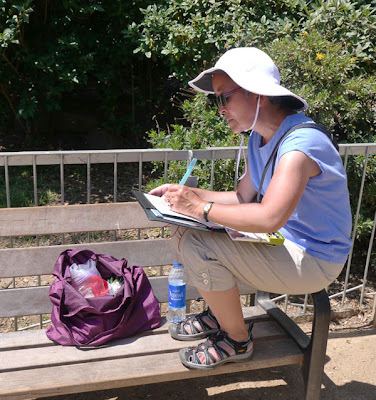 Tina sketching Sagrada Familia in the scorching sun. 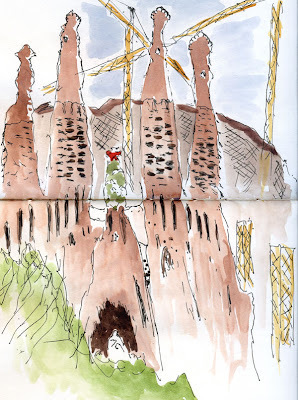 Something about this post gives me the feeling that I sketched in Barcelona with you. 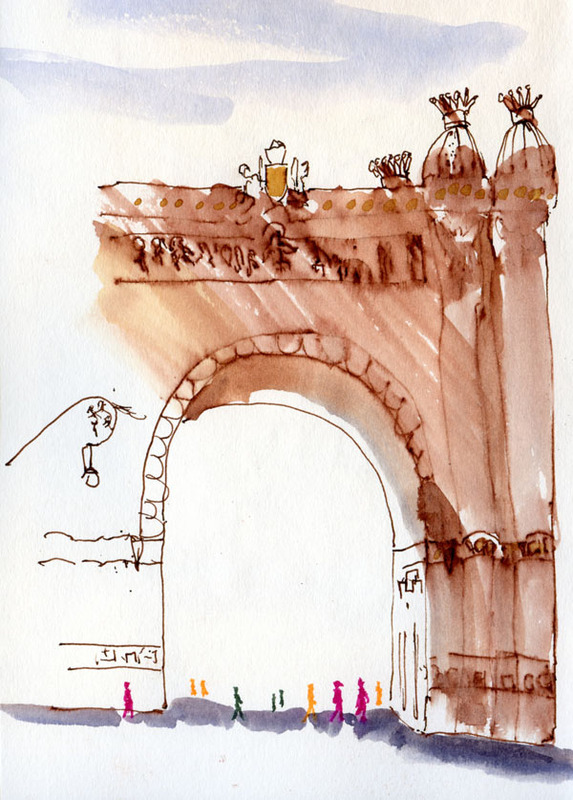 Love your Arc sketch as the watercolor application makes it so dynamic. Wish I could do some of that. Thanks for the great trip. I think you found the exact way of putting what the Symposium was for most of us. Thank you and glad to know you enjoyed it so much! Tina, this is a lovely and eloquent post. I agree with Silvia's comment above. The sketching was fantastic but the warm, generous people (of Barcelona and of USK) are what made it such truly wonderful experience--and all in glorious Barcelona! I enjoyed sketching with you and hope to do so again. Tina, I agree with Larry's comment above. You portrayed the essence of people and place so vibrantly! I can't wait to see you on a sketch crawl in Seattle. And I am forever grateful that you introduced me to Gabi and Urban Sketcher only a year ago at Kruckeberg Botanical Gardens in Shoreline! Thanks for your nice post, you make us feel proud. Best! Thank you so much!!! You got it!!! Thank you, everyone! You and Barcelona will continue to inspire me, long after I've returned home. I've found the experience of the group picture moving as well, for each of the symposiums I've attended. It is a moment that crystallizes the shared experience of the symposium, and it's a feeling I've carried with me from each event. hi tina- was so nice to meet you!!! and I agree with your comments... its all about people - People are always more important than art. It is the creative energy of the people that is the biggest impact. Love your approach to the arc as well. happy sketching!